Justice Pesticides’ partner, PAN Asia Pacific (PANAP) has recently released the results of a seven-country study on the impact of highly hazardous pesticides (HHPs) on people’s health and the environment. The report’s launch coincided with the commemoration of the International Day for the Eradication of Poverty on October 17. 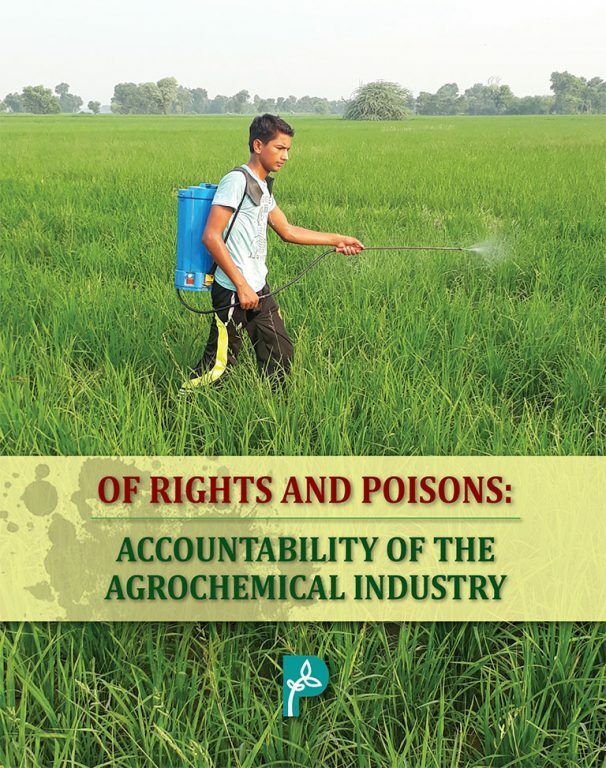 The study, called “Of Rights and Poisons: Accountability of the Agrochemical Industry” revealed that HHPs remain widely used in the countries surveyed, which include Bangladesh, India, Indonesia, Malaysia, Pakistan, the Philippines, and Vietnam with a total of 2,025 respondents involved. It shows that poor rural people are the most vulnerable to pesticide poisoning and the increased use of agrochemical worsens their poverty. Seven out of 10 of the respondents interviewed said they have suffered ill-effects due to pesticide exposure, said Ms. Sarojeni Rengam, Executive Director of PANAP and Justice Pesticides’ Board member, one of the authors of the report. Commonly reported health issues include respiratory, skin, cardiovascular, gastrointestinal, EENT (eye, ear, nose, throat), and neurological problems. This report by PAN Asia Pacific and its partners found that the agrochemical transnational corporations (TNCs), their subsidiaries as well as local pesticide manufacturers and distributors are producing and distributing HHPs that cause acute and chronic health effects, particularly to children and other vulnerable people. These pesticides are also known to cause environmental damage and loss of biodiversity. “It is clear that agrochemical corporations are responsible for violating the human rights to life and health; access to information; safe working environment; and livelihoods. They violate children’s rights, women’s rights, and indigenous peoples’ rights. All for the sake of profits,” Ms. Rengam said. “Pesticides are a serious human rights issue that is not being adequately addressed at national, regional or international levels. This report shows that international agreements and treaties are not working. Industry stewardship programs are a sham,” said Dr. Meriel Watts, PANAP’s senior science and policy advisor. Dr. Watts noted that poverty is often characterized by malnutrition, which can worsen the effects of pesticides. “Pesticide poisoning aggravates the cycle of poverty and ill health and the malnourished become less able to provide food for themselves,” she stressed. As farmers resort to more toxic pesticides, to increased spraying, or to dangerous cocktails, it is not only the health impacts that are not intensified. Many also fall into debt and poverty to keep up with increasing use of expensive chemicals and crop loss. PANAP renews its call on the global community to negotiate a global legally binding treaty that phases out HHPs and replace them with agroecology. Such treaty should pave the way to the dismantling of TNCs’ power over the United Nations (UN), governments and farmers. “Under this treaty, the industry will be held accountable for the human and environmental impacts of their pesticides and containers. It will also stop the double standards of countries banning pesticides but are still manufacturing them for export,” added Ms. Rengam. PANAP asks individuals and groups to join the global call for such a treaty to “End corporate greed! Rights now!” by signing the petition. While poverty has various dimensions, addressing pesticides’ serious impacts on people’s physical and economic wellbeing could go a long way in helping eradicate global poverty, which is most felt in the rural areas, the PANAP official argued. The results of the study were generated through PANAP’s Community Pesticide Action Monitoring (CPAM) as well as fact-finding missions. CPAM is a participatory action research approach to document and create awareness on pesticide impacts on human health and the environment. It involves community members who undertake the research, and encourages organizing and action.